The U.S. Pan American Men’s Water Polo Team finished group play undefeated after downing Argentina 14-3 earlier today. The Canadian Women’s Water Polo squad remains unbeaten at the World University Games after winning 7-5 over Hungary in the quarterfinal round. Josh Samuels led the way on offense with four goals while Merrill Moses and McQuin Baron did the job in net combining to turn aside eight shots. The U.S. Pan American Women’s Water Polo Team picked up their second straight victory as they topped Cuba 18-3 earlier today. The Canadian Women’s Water Polo squad advanced to the quarterfinal round. Indiana University sophomores Kelly Matthews and Sarah Myers have made major contributions to Team Canada’s success. The U.S. Pan American Women’s Water Polo Team opened up the competition at the Atos Markham Pan Am Centre in strong fashion with a 25-3 victory over Mexico earlier today. Ten members of the 2015 Indiana Water Polo squad received All-Academic Honors for their outstanding achievements in the 2014-15 academic year. Serbia emerged victorious at the FINA Men’s Water Polo World League Super Final 2015, the team’s ninth success in this competition and the third consecutive. The USA Men’s Senior National Team appeared well on their way to a bronze medal at the 2015 FINA World League Super Final only to see Brazil rally for a shootout win 24-23. The USA Men’s Senior National Team lost to Croatia 11-6 earlier today in the semifinal round of the FINA World League Super Final. Freshman Kelly Matthews and junior Candyce Schroeder received honorable mention All-American honors from the Association of Collegiate Water Polo Coaches, the ACWPC announced Friday morning. 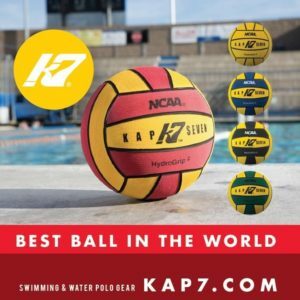 Luca Cupido (Newport Beach, CA/California/Newport) drew a penalty with 2.5 seconds remaining in the fourth quarter and Tony Azevedo (Long Beach, CA/Stanford/NYAC) converted to lift the USA Men’s National Team over Hungary 8-7 earlier today in quarterfinal action at the FINA World League Super Final. The USA Men’s National Team fell just short on day two of the FINA World League Super Final, losing to Australia 10-9. Greg Mescall talks FINA, chats with Adam Krikorian, and helps us take to the skies. USA Water Polo National Team Head Coaches Adam Krikorian (Women) and Dejan Udovicic (Men) have announced the rosters for the upcoming 2015 Pan American Games taking place this July in Toronto, Canada. Both teams won gold at the 2011 Pan American Games in Guadalajara, Mexico and will look to defend their crown come the start of competition on July 7.